Ben Loomer knew he would do something in the music field from an early age. After spending a summer working at Cazadero Music Camp, he realized how fun and rewarding teaching music was and decided to study music education. Loomer earned an Associates of Arts degree in music from Los Medanos College and a Bachelor’s degree in music education from University of the Pacific. Loomer has taught music in the San Ramon Unified School District since 2007, teaching music from elementary all the way to the high school level. Currently, he teaches instrumental and vocal music at Stone Valley Middles School in Alamo, CA and is a music instructor at Cazadero Music Camp during the summer. Loomer has taught marching band at Northgate High School, in the Mt. Diablo Unified School District and had a small tenure directing the Walnut Creek Presbyterian Church Bell Choir for three years. 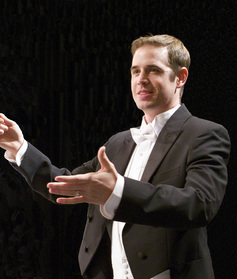 He has been playing with the Contra Costa Wind Symphony since 2008, was featured as a soloist in the winter of 2010, and is currently the associate conductor, conducting regularly in performance over the last several years. Along with teaching, Loomer currently works as a freelance trumpeter, has performed in Stars 2000 productions, accompanied the Ashmolean Singers and the Diablo Women’s Chorale, and is currently part of a worship team at Walnut Creek Presbyterian Church, where he leads a brass ensemble. Loomer resides in Livermore with his wife, Meridee and their three cats.